Authors Note: If you are looking for a brief summary of this article, I recommend scrolling down and looking at the graphics first. You can click on each image for a larger view. Two recent news stories have dominated the college sports headlines in past week. The first was the O’Bannon verdict being delivered against the NCAA and the second was that the Power-Five (P5) had successfully gained the autonomy to self govern themselves in certain areas of college sports. These stories may have stolen the headlines, but there was another news story that should also be of great concern for the Group of Five (G5). That story was an ESPN article stating that of the 65 coaches in the P5, 30 of them (46%) favored playing exclusively P5 opponents whereas 23 coaches (35%) were opposed. The remaining 12 coaches (18.5%) were undecided. Five years ago if the same poll was to be conducted, the coaches of the BCS (the P5 predecessor) would have been firmly against this idea. Today we find more P5 coaches supporting the measure than opposing it. So what happened? The College Football Playoffs happened. Today coaches are looking at ways to beef up their teams resume for the Playoff Committee. Under the old BCS system, the strategy was to play a relatively weak schedule in an attempt to survive the season while obtaining the least amount of losses as possible. What makes this story such a huge red flag for the G5 is that BCS/P5 coaches have traditionally been their strongest supporters of a continued relationship with G5 and FCS programs. The decline in support among P5 coaches is an alarming signal that G5 support is rapidly drying up. These changing attitudes are not just prevalent in the coaches but athletic directors as well. Athletic directors are seeing an increasingly disturbing trend of declining game attendance and/or fans leaving early during games. This trend comes on the heels of increasing ticket prices and technological advances that make games easier to watch from home. In the past the traditional scheduling attitudes from the perspective of an athletic director was to maximize the number of home games in an attempt to maximize revenue. Why play a home and home with a P5 program when a school can schedule two G5 programs without having to give an away game instead? In an attempt to win back the support of fans, a number of athletic directors are now taking a much harder look at the opponent quality of their home schedule more than ever before. So what does this mean? It means Georgia is “in” while Georgia Southern is “out.” The Big Ten already started this trend by announcing an end to the practice of scheduling FCS programs while adding a ninth conference game which means one less out-of conference (OOC) game for a G5 program. The SEC and ACC already fired a shot at the G5 by requiring at least one P5 opponent in their OOC schedules. The Other three P5 conferences now play nine-game conference schedules. This translates into fewer OOC slots for G5 programs. Despite my focus on the coaches’ poll story, the news regarding autonomy as well as the O’Bannon trial verdict is also a big deal. The new power granted to the P5 will further increase the resource gap between the P5 and the G5, as well as a second resource gap between AAC/MWC and the three remaining G5 conferences. These resource gaps will only further the divide between these three groups of conferences. A very common theory by college sports analysts, and one that I personally agree with is that this growing divide in resources will ultimately lead to a Division IV breakaway lead by the P5. 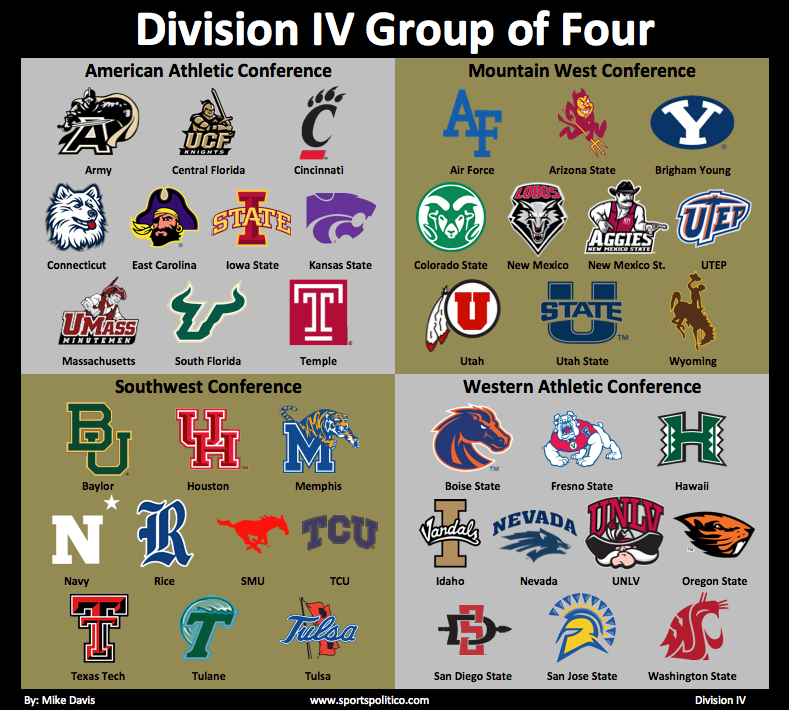 The term “Division IV” has been mentioned several times during the offseason as a possible action being taken by the Power-Five (P5) if they could not obtain the autonomy to give themselves greater legislative power. 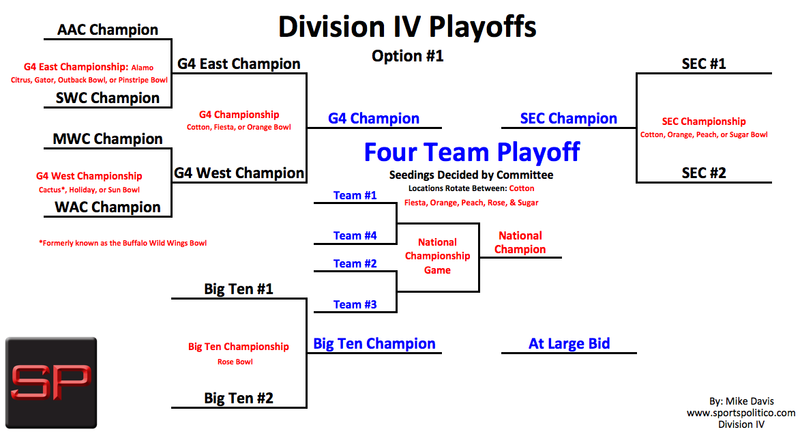 While the term “Division IV” (D4) originated out of discussions dealing with autonomy, speculation about the possibility of a P5 breakaway has been further enhanced with the O’Bannon ruling and the recent vote granting the P5 autonomy. So since we are going to keep seeing discussions about D4 pop up over the next couple of years, I might as well make my own hypothetical version of what I think it could potentially look like. One important thing to note is that talks of a P5 only D4 breakaway are ridiculous. 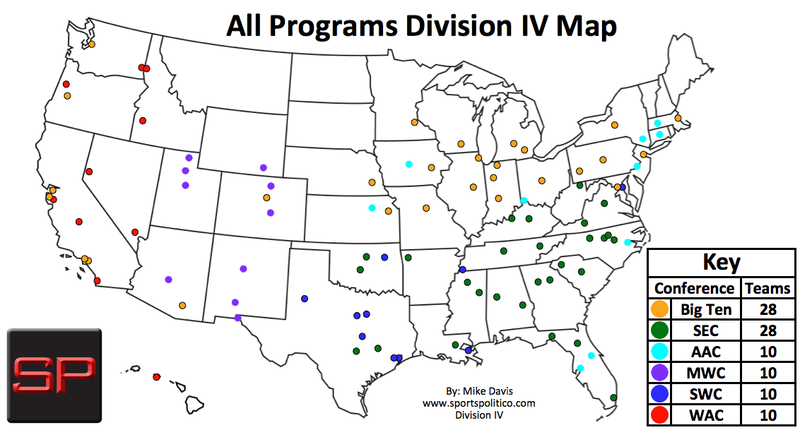 At the very least a selected number of G5 schools will be a part of the new Division IV. To further explain why these schools will be included you can click on Part II below. The creation of D4 presents an opportunity to fix a lot of problems related to conference stability, conference scheduling, and the playoffs. I worked to solve these problems by creating two large conferences based on the SEC and Big Ten. 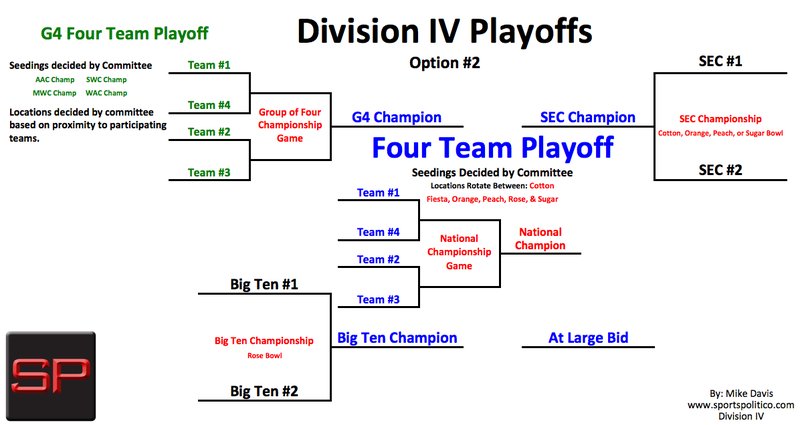 This is my best-shot at the most realistic Division IV scenario possible. 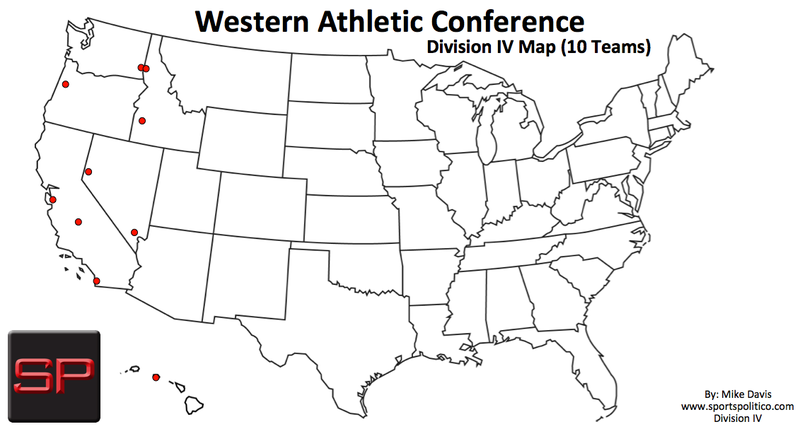 This is not something that I believe has a serious chance at happening in the coming months or my prediction of how conference realignment/Division IV will play out in the future. This is the way I would build it if I had the power to align all of the FBS schools. 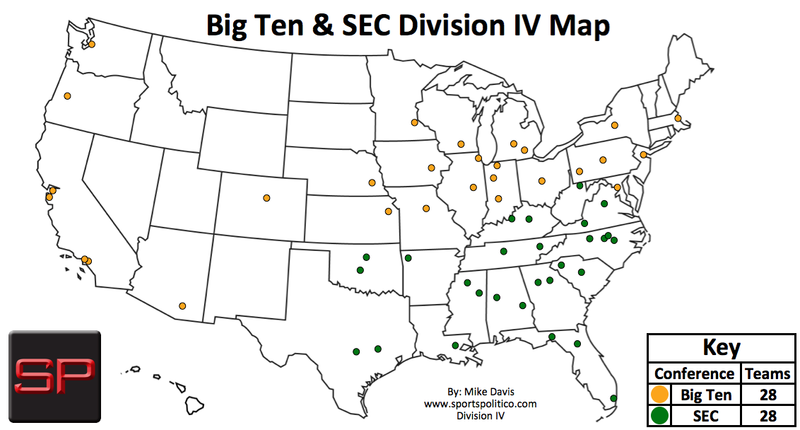 While I call this “Division IV,” it’s also a conference realignment/FBS split scenario. Remember that in order to make this scenario have a realistic chance of happening, existing grant of right contracts need to be voided. 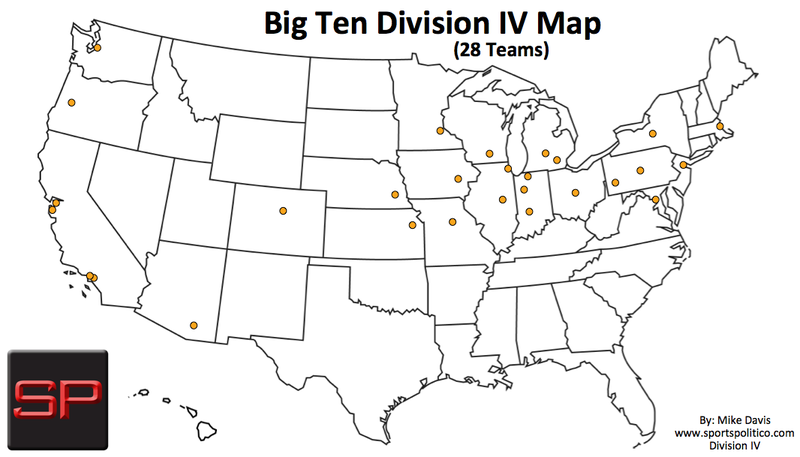 As you can see, the Big Ten acquires the Northern ACC schools, numerous Pac-12 schools, plus Kansas and Missouri. This new conference was designed to be an athletic force as well as a top academic conference. Football wise, the conference gets a badly needed improvement, Oregon, Stanford, and USC will help improve the diminished image of Big Ten football. In basketball it’s a case of the rich getting richer. What already was one of the top basketball conferences acquires four elite programs in Kansas, Syracuse, UCLA, and Arizona. The conference also acquires a massive increase in the size of the conference footprint while becoming a national coast-to-coast conference. You didn’t think I would really let the Big Ten become a much stronger football conference without doing the same for the SEC now did you? Alabama meet Texas, Clemson, Oklahoma (again), Florida State, and Miami. This conference has become a southern football fanatics dream. All of the Southern football powers are united under one conference. Rivalries such as Florida-Florida State and Texas-Texas-A&M are now elevated as in-conference rivalries. Another upgrade is in basketball. The addition of Louisville, Duke, and North Carolina are a serious upgrade for the conference and make a potential SEC-Big Ten basketball challenge quite fascinating. 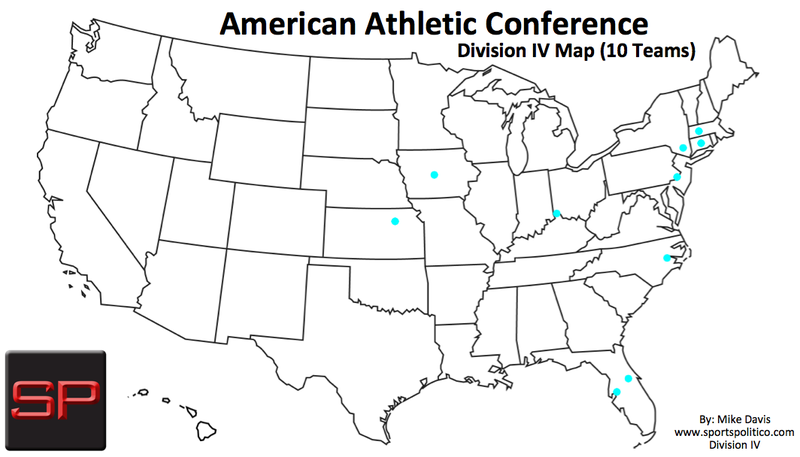 When you display the two super-conferences on a map, the separation looks geographical. You have a clear border between the conferences that also reflects a regional, political, and even cultural divide between the country as well. Speaking on behalf of the Universities from these two conferences, the divide in this map is also reflective of their traditional associations. The Pac-12 and Big Ten have historically been best buddies. Meanwhile the Northeastern schools in the Big Ten also have extensive history with each other. The SEC and ACC have common history in the Southern Conference. In this setup, these two conferences will have an automatic bid to the four-team playoff awarded to the Big Ten and SEC champion respectively. The technical term would be the Power-Two (P2) or AQ schools. So how is the conference champion selected? Hey college football, meet your old friend the BCS. Yep, two steps forward and one step back. The conference champions of the SEC and Big Ten will have to be decided on a computer ranking system, a poll, or a combination of both. The BCS will select the top two teams from each conference and have them face off in their conference championship games. Yes it stinks, yes it brings back a chapter in college football that college football fans who don’t chant their conference names would rather forget. I am not exactly thrilled with using the BCS or a BCS-like computer system. I wish there was a better way to do it, but there was really no way to split either of these two conferences into divisions or pods without ruining rivalries, or destroying competitive balance. To make conference schedules I use a self-created scheduling methodology called Independence Based Conference Scheduling (IBCS). The concept of it is rather simple, the 28 members of each conference act as independents within the conference. Big Ten members are free to schedule each other in a manner similar to the way Army schedules FBS programs as an independent. For more information on Independence Based Conference Scheduling you can click on Part VI below. This is where the AAC, MWC, and the P5 schools that I didn’t add to the SEC and Big Ten end up. In addition, I threw in a couple of independent, Conference-USA, and Sun Belt schools to balance things out. If you want a more in-depth explanation of how I came to choose these schools you can find it below. So how did I end up with these schools? I started out with nine schools from the P5 that were left without a conference after my raids on the Pac-12 and Big 12. From there I added all the schools from the AAC and MWC. Those two conferences are more than deserving of a D4 bid because they have shown a willingness to match the financial commitment of the P5 when it comes to providing better services to their student athletes. Next came two independents that had absolutely no business being left out if the MWC and AAC get the chance to play D4. They are Army and BYU. Next came filling in the holes and trying to balance every conference out at 10 teams. These programs were Idaho, New Mexico State, UTEP, Rice, and Massachusetts. As bad as the current state of a lot of these programs are in, my selection criteria were based primarily on geography and who the particular schools rivals are. So if your school didn’t get into the SEC/Big Ten or even D4, it is not an insult at your school’s football team or fanbase. Conference realignment has so many factors to consider a lot of which have nothing to do with a schools athletics or fanbase. My plan was to form four geographically compact conferences based primarily in the four different time zones. While the demographics of these states are extremely different, to make these conferences work successfully, I felt it was better to emphasize rivalries and geography over demographics. It is my firm belief that having a strong connection between the memberships of a conference is ultimately what makes said conference successful. Now I know a lot of fanbases would love to see this setup in action, while others are thinking of ways to kill me. Kansas State (KSU) and Iowa State (ISU) fans are probably the first in line getting their tar and feather ready. Why in the world are they in a conference with Army and Massachusetts? In fact they have pretty much zero history with every school in their new conference. The reason is competitive balance. I wanted to make sure that all of these ten team conferences are as evenly matched as possible. For eight schools this setup is a nice upgrade, for the ISU and KSU it’s the biggest downgrade in all of the D4. 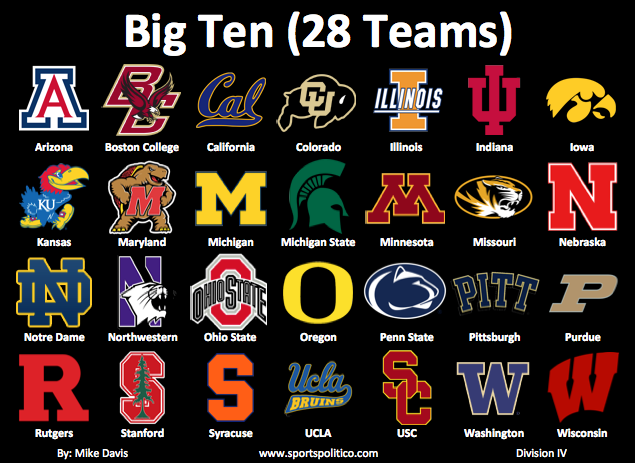 The worst part is that ISU is without a doubt the 29th Big Ten school if the conference had one additional slot. 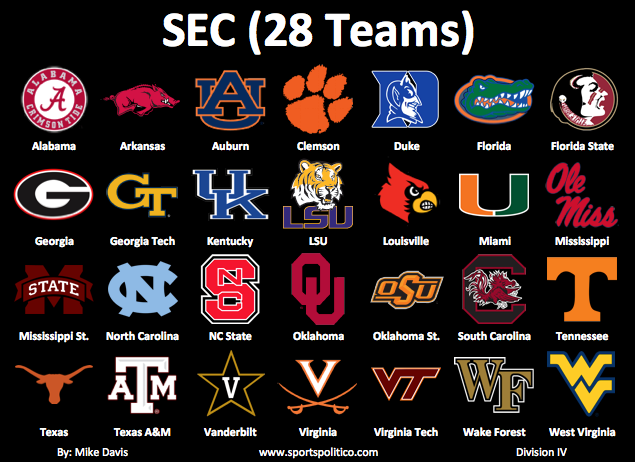 Unfortunately for them I couldn’t find three more schools for the SEC and Big Ten to get them both to 30. Kansas State has had a strong program lately, but at the end of the day they don’t have the academic/athletic combination that the Big Ten is looking for and would be too much of an outlier in the SEC (remember that in this scenario, Missouri is no longer in the SEC). This setup is a tough pill to swallow for the TCU, Baylor, and Texas Tech. During this project one of my goals was to correct past conference realignment mistakes and place schools in the conference that they rightfully belong in. For these three schools their current membership into the P5 is due to political intervention. They are the byproduct of Texas politicians who have time and time again managed to prevent a Texas (UT) and Texas A&M (A&M) combo from joining any other conference without bringing some in-state brothers along. The state of Texas should be represented by Texas and Texas A&M in the SEC. The past interference by Texas politicians trying to turn this duo into a quartet is something that has ended up hurting Texas, Texas A&M, and a number of conferences in the past more than it has helped. That is why I wanted absolutely nothing to do with 3-5 Texas schools in the SEC. This ten-team conference brings together three trios of schools plus Arizona State. The first trio is Utah, Utah State, and BYU. These are three in-state rivalries that are played annually, but oddly enough none of these three schools belong to the same conference. BYU is the big winner here. The Pac-12 was never going to happen and this setup allows them to once again be on equal terms here. The state of Utah is also a big winner as their three schools are finally in the same conference. The second trio is New Mexico, New Mexico State, and UTEP. The three are historical rivals of each other, but like the first trio, none of these three schools are in the same conference. The last trio is Air Force, Colorado State, and Wyoming. Colorado State has an in-state rivalry with Air Force, and a regional rivalry with Wyoming. Meanwhile Wyoming and Colorado State have played Air Force more often than any other programs. Arizona State may seem like an outlier here, however they have common history with most of these schools due to their past Border and WAC conference affiliations. The gatekeepers of the west, this conference will allow for the restoration of two historic rivalries involving the University of Idaho as annual matchups. The first comes against in-state rival Boise State, the second comes against Washington State, a school located just eight miles away from the University of Idaho. The competition between Oregon State, Washington State, Fresno State, and Boise State will be rather interesting. The situation for football in the west remains largely unchanged as every single FBS team in the western states retains their spot at the highest level of football. 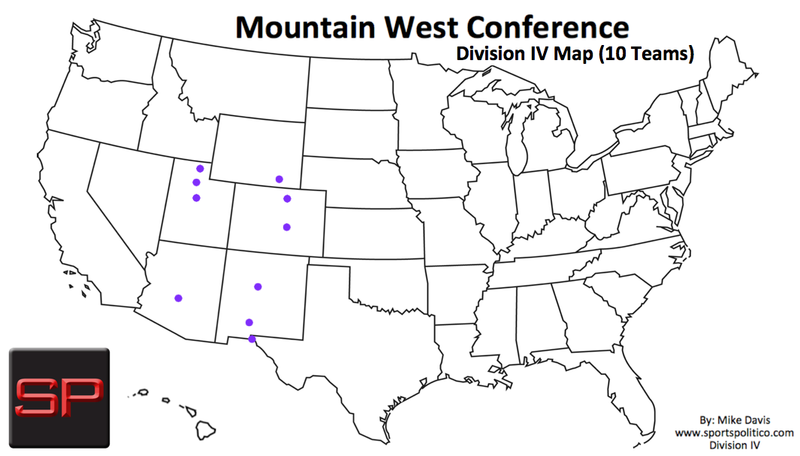 No school from the Pac-12 or MWC states are left out of D4. This is what the Group of Four (G4) looks like when it is all said and done. My philosophy was to have the two 28-team automatic qualifier (AQ) conferences (SEC & Big Ten) and a large 40-team conference whose champion would receive the AQ bid to the four-team playoffs. The theory is that having to work though an easier slate of teams but more teams overall (and thus more games) balances out the other two conferences having to work though a harder slate of teams, but fewer teams (and thus fewer games) overall. In other words quantity verses quality. The third “conference” is this Group of Four, which is in this setup, the exact same thing as the real life Group of Five. But whether or not it is a conference depends on the structure and setup. 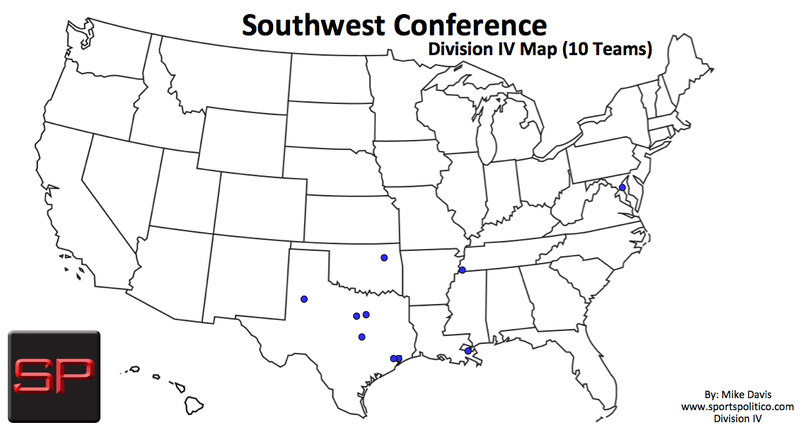 I named the ten-team divisions after historic conferences so readers could better understand their origins. There are two ways to go about the setup of this conference. I provide two options because both have their pros and cons, however I felt that this is the kind of call that a conference realignment blogger simply cannot make. The way this conference is setup also has implications on the playoffs. Emphasize the G4 as an East-West conference and aspire to make the AAC/SWC and MWC/WAC play each other as often as possible. The programs play a 10 game conference schedule. They play nine games against their division opponents. They play a cross-division matchup that is always against a program from their “rivaled” division. Every year the AAC and SWC face off for the G4 East Championship while the MWC and WAC face off for the G4 West Championship. The two regional champions then square off with the winner earning an AQ to the four-team playoff for the national championship. Emphasize the G4 as a national conference and aspire to make all four “divisions” play each other as equally as possible. The programs play a ten game conference schedule. They play nine games against their division opponents. They play a cross-division conference game against an opponent from a different division each year. Every year the four division winners are seeded by committee and face each other in a four-team playoff for the conference championship, the winner of the playoff then enters the field for the four-team national championship. This is what Division IV looks like when all is said and done. The net result would cause a chain reaction that has reverberations all the way down to Division II. There are 33 teams that do not make the Division IV cut. They would make up a (new) FBS. If they backfill by adding the top FCS programs they could have an extremely competitive division that offers the same financial flexibility that FCS has, but greater media coverage/fan support. 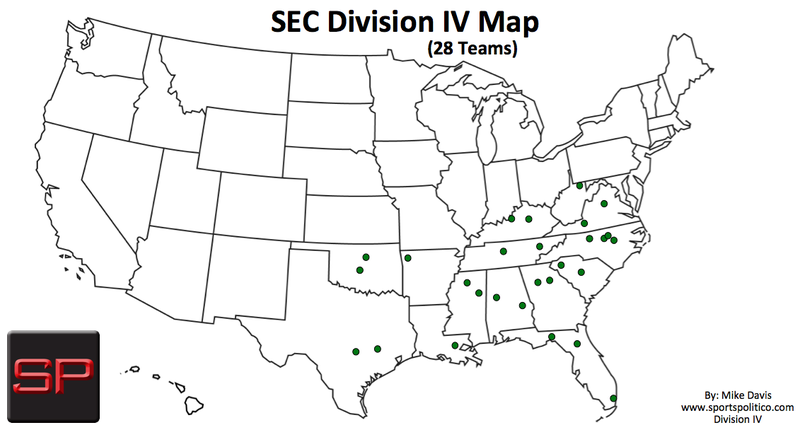 The FBS Division could be anywhere from 33-70 teams. FCS would become less prestigious but would also have a more equal playing field where the gap between the top and bottom conferences would not be as extreme. This new Division IV will be what is often perceived as the inevitable breakaway between the high resource and low resource membership of FBS. This new setup will allow for the P5, MWC, and AAC to further expand their revenue streams. The big elephant in the room is the playoffs. I kept them at four teams just because I wanted to keep the word count low and not further complicate this setup by reworking the amount of teams in the postseason. I know this system isn’t perfect, I know that some fans hate me because of where I placed their programs. This project was done to the best of my ability trying to make the best possible D4 setup while making things as realistic as possible. If you have further questions you will most likely find them in Part VIII linked down below which wraps up the loose ends in a Q&A format. I totally agree with the notion that these are among some of the weakest schools in FBS. In fact if I had to make a list of ten schools most likely to drop from FBS all three of those schools would be on that list. The reasoning for choosing the last 4-6 slots was 1. geographical proximity and 2. Being a rival of other D4 schools. Idaho & NMSU were the only schools remaining in the West, plus each school brings not one, but two historic rivalries to their new respective conferences. UMASS was the last school I picked. ASU while a terrific program, didn’t fit in geographically with my version of the AAC. However Buffalo & UMASS did. I choose UMASS over Buffalo because the UMASS-UCONN matchup is one of the few G5 rivalries that casual fans across the nation can identify with. ASU had the bad luck of being in the one part of the country where I already had enough schools from the AAC & Big 12 to build a conference. Had ASU been a rival of Arkansas, they would of without a doubt have been included, instead the relationship between the two in-state schools is the quite opposite of that. I didn’t want to pick schools based on the current status of their program because a troubled athletic program such as UMASS can easily have their problems fixed if put into a strong conference with a decent TV contract. UMASS right now struggles at the FBS level, but an AAC invite and a lot of their problems will go away. Same can be said for Idaho & NMSU with the MWC. Would they do so at will…of course not, could they be left out by the AAC, MWC, & P5? Maybe. NIU has had decent football in the past couple of years, but their demographics match up horribly with the methodology I choose which was looking at their rivals (which they had none with the D4 schools I picked) and they came from a region where I didn’t build a Group of Four conference.